GERMAN: Echter kapernstracuh, Doniger kaperstracuh, Kaper, Kapernstrauch. HUNGARIAN: Kapri, Kapribogyo, Kapricserje, Kaporna. SPANISH: Alcaparro, Alcaparron, Caparra, Tapana. Alcaparras is a dicotyledonous perennial shrub growing to a height of 1-2 meters, with an extensive root system. Plant is shrubby and many-branched. Leaves are alternate, thick and shiny, round to ovate. Flowers are solitary, sweetly fragrant and showy, with four sepals and four while to pinkish-white petals, and many long violet-colored stamens, and a single stigma rising well above the stamens. Fruit is a berry with a thin, leathery to corky pericarp, ellipsoidal, 2.5 to 5 centimeters by 1.3 to 1.5 centimeters, olive green with distinct ribs. Seeds are numerous, subglobose, 4 millimeters in diameter, embedded in a yellow pulp. - Introduced from the Marianas. - Scattered all over the pacific. 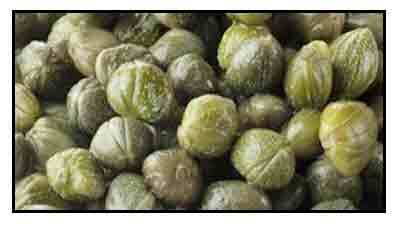 - Cultivated in some localities in Luzon. - Occasionally cultivated in Manila. - In Bohol, spontaneous along the seashore. - Caper seeds in the cybermarket. Sorting Capparis names / Maintained by: Michel H. Porcher / MULTILINGUAL MULTISCRIPT PLANT NAME DATABASE / Copyright © 1995 - 2020 / A Work in Progress. School of Agriculture and Food Systems. Faculty of Land & Food Resources. The Univers ity of Melbourne. Australia. Inhibitory Effect of Capparis spinosa Extract on Pancreatic Alpha-Amylase Activity / Mostafa Selfayan, and Foroogh Namjooyan / Zahedan J Res Med Sci., 2016 April; 18(4): e6450 / doi: 10.17795/zjrms-6450. 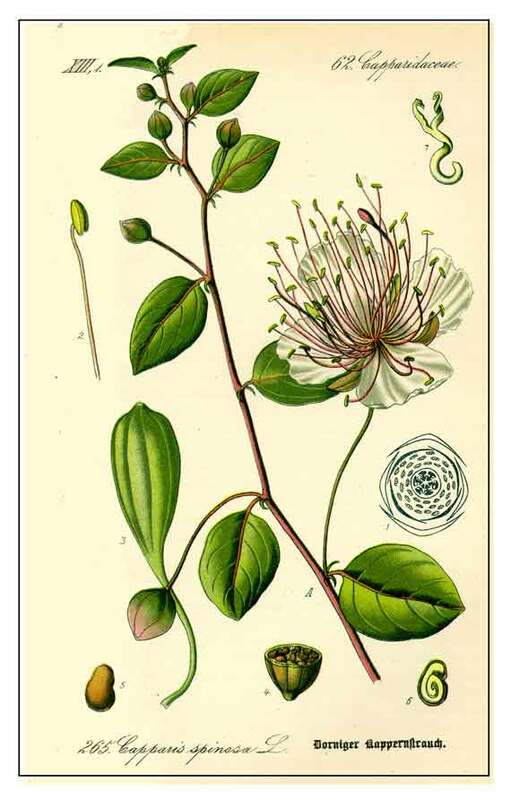 Studies of Antioxidants and Xanthine Oxidase Inhibitory Potentials of Root and Aerial Parts of Medicinal Plant Capparis Spinosa L. / Abderrahmane Baghiani, Djamila Ameni, Sabah Boumerfeg, Moufida Adjadj, Meriem Djarmouni, Noureddine Charef, Seddik Khennouf, Lekhmici Arrar / American Journal of Medicine and Medical Sciences, 2012; 2(1): pp 25-32 / doi: 10.5923/j.ajmms.20120201.06. 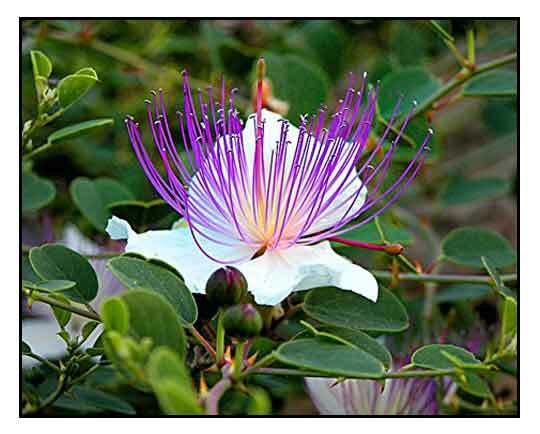 Daily Consumption of the Capparis spinosa Reduces Some Atherogenic Indices in Patients with Non-alcoholic Fatty Liver Disease: A Randomized, Double-blind, Clinical Trial / Narjes Khavasi, Mohammadhossein Somi, Ebrahim Khadem, Mohammad Hossein Ayati, Mohamadali Torbati and Seyyed Muhammad Bagher Fazljou / IRCMJ: Iranian Red Crescent Medical Journal, 2018; 20(11): e63446 / doi: 10.5812/ircmj.63446.